6 Different Versions of haunted windows that mix LIVE ACTION with Hollywood CGI FX to offer your haunted house the high tech feel! Prepare to make your haunts interior windows appear to be real from a raining night, banging shutters, to zombies and demons trying to break into your haunted attraction. 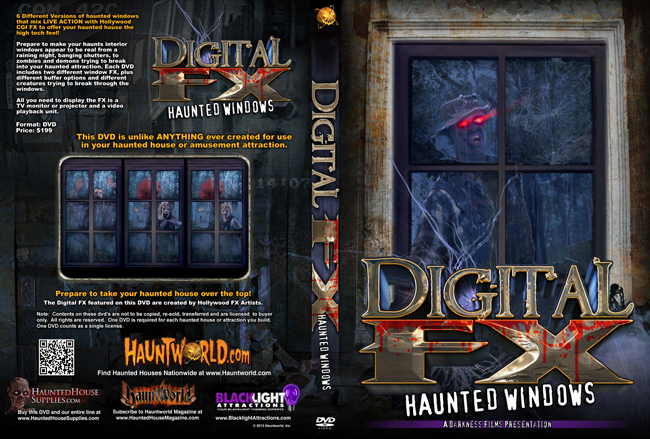 Each DVD includes two different window FX, plus different buffer options and different creatures trying to break through the windows. All you need to display the FX is a TV monitor or projector and a video playback unit. only. All rights are reserved. One DVD is required for each haunted house or attraction you build. One DVD counts as a single license.